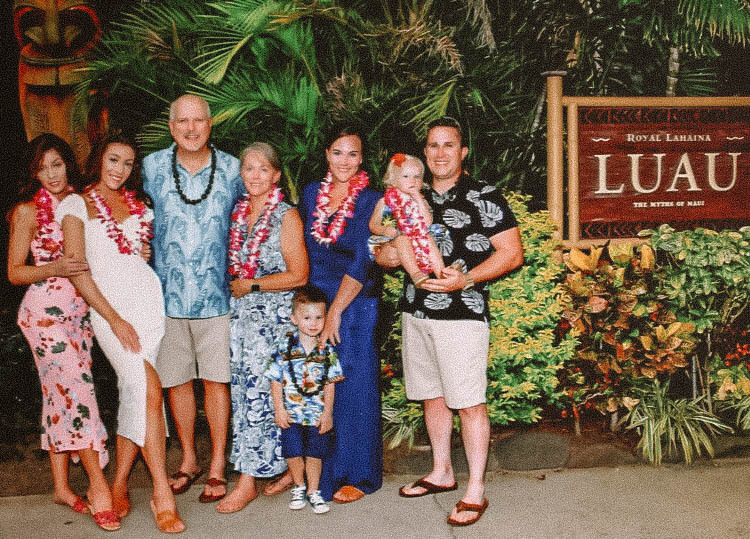 Our family has not taken a vacation together in so many years, that’s why we were so excited for this trip to Maui, Hawaii! We could all be together in one place for a week! From boat rides to snorkeling, and luaus to family photos, we used the most of our time while in Hawaii. Our Instagram highlight reel from our trip shows all the spots we went to and restaurants we ate at! We stayed at the Condos- which were absolutely amazing because they are bigger than a hotel, and yet still made you feel like you were at a resort! Hawaii in October is beautiful, it’s not too hot but not cold either, we’ve only ever gone to Hawaii during the Summer months, so this was new for us. We had the best time during our week-long stay, and are hoping that this trip becomes a family tradition for us! We absolutely loved our stay at the Estancia Hotel in La Jolla! Although our stay-cation was only for a weekend, we had the best time! The Estancia has the most wonderful, calming ambiance. We were able to relax from the time we got there to when we left. The overall Mediterranean decor is so beautiful, we felt like we were in another country even though we were still so close to home. The staff are all so nice and friendly, we felt so comfortable in our room, the lobby, the restaurants, and pool areas. Taking photos around the Hotel was so fun because every corner is so picturesque! From breakfast in bed, to relaxing by the pool, The Estancia was the perfect place for us to feel like we were on vacation, while still being able to work on our blog! We definitely recommend that you stay at Estancia for an amazing and relaxing getaway! As you all know by now, we love Harry Potter. We're sure you also know, that we love attending concerts at the San Diego Symphony year-round. Getting to watch our third Harry Potter film concert, "The Goblet of Fire," was absolutely incredible. Not only is the orchestra music amazing, but being outside and right next to the water is always an incredible experience. We are always recommending the symphony to our friends, because it is definitely one of the best things to do in San Diego! We were able to get a table with seats for this performance, which made it really special for us. Although we love the picnic seats, the table seats were a fun change! The Bayside Summer Nights concerts have just begin so go before Summer ends!! Our outfits are from one of our favorite boutique stores here in North County, San Diego, named Liv 3. We love that three sisters own and run the store and sell the cutest clothes and goodies. We felt that these crisp white and pastel colors were perfect for this outdoor, summer event! These gaucho pants with flowy fabrics made for the most comfortable- yet cute outfits. Having the opportunity to work with Organics by Red Bull was so amazing! Pitching this beach-tent idea was accepted because we knew it would be a hit with our friends, family, and fellow bloggers. Since the color scheme was beach-neutrals, we knew the soda can colors would pop out for passerby's. It was such a beautiful, relaxing evening, we think everyone who came had a great time. The ocean was our backdrop and view for our photos and throughout the night. "ORGANICS by Red Bull are made with ingredients from natural sources and certified organic in accordance with the USDA National Organic Program, and come in four distinctive varieties. ORGANICS by Red Bull are refreshing beverages, not energy drinks. ORGANICS Simply Cola contains caffeine in amounts similar to other conventional cola beverages, while the other ORGANICS products are caffeine-free. "The end result is four distinct, great tasting, and refreshing organic sodas made with ingredients from natural sources for your enjoyment: Simply Cola, Bitter Lemon, Ginger Ale, and Tonic Water. (RedBull.com)." Although we do not drink too much soda, we absolutely love ORGANICS. The unique flavors, cool cans, and overall purpose for the drinks are so fun! We definitely recommend trying these drinks for a refreshing Summer drink! Our time with the San Diego Symphony, once again, was phenomenal. Apart from being huge fans of the Harry Potter series, we have grown to absolutely love attending these symphony performances. It's always an incredible experience to listen to the orchestra and be completely captivated by the music. Although we did not dress up in the Harry Potter class colors, there were a few attendees who did, and it was so fun to see! During the performance, it seemed that the audience was so engaged with the music and film that was being played simultaneously. We truly want each and every one of you to experience this for yourself, it's definitely worth it!! There are performances that go on throughout the entire year of all genres, so there is sure to be something that you'll love! Getting to enjoy the afternoon at the SD Symphony was so much fun! We usually go to the night concerts, but Ratatouille was on a Saturday afternoon. Since we love all things Disney, the cartoon movie, Ratatouille was so fun to watch. The orchestra performed alongside the movie that was playing, and it was absolutely amazing! There are so many fun-filled Holiday concerts coming up, for us, they're always the best way to get into the festive spirit! Go check out what's playing! We got our hair done at Blow Pop Salon at Horton Plaza where they did our hair in some cute braids for the symphony! Our outfits were created with pieces that were currently in our closets, from stores like: Forever 21, Chicwish, Shop Salt & Arrow, and more! Going to the San Diego Symphony is always one of our favorite events to do. We were so excited when we were asked to attend the Black tie Season opener event. 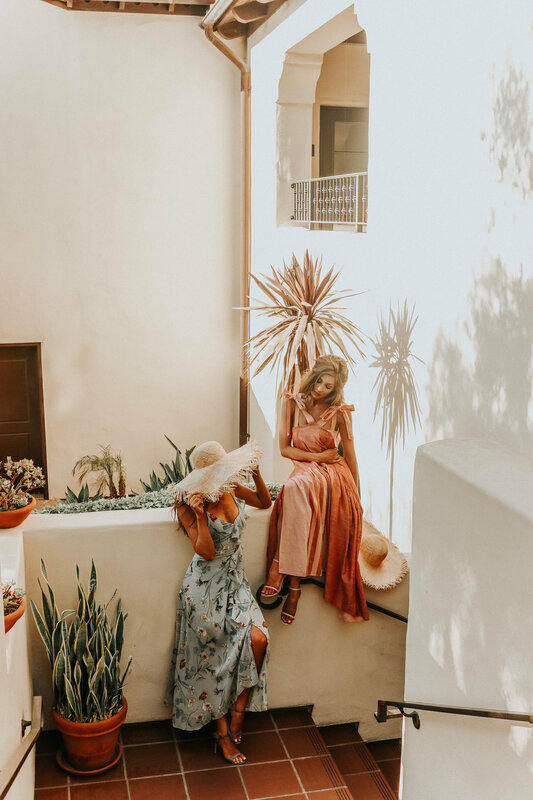 Getting dressed up in beautiful powder blue and burgundy Jarlo dresses, Public Desire heels, and getting our hair done at BlowPop SD Salon, all led to an overall exceptional experience! From the pre-concert festivities like delicious hors d'oeuvre, live jazz music, photo booth fun, and food tastings, we had a spectacular evening! Guest conductor, Edo de Waart, Richard Strauss’ Ein Heldenleben, performed “A Hero’s Life” with musical mastery, Richard Wagner’s short Meistersinger prelude. French piano superstar, Jean-Yves Thibaudet, brought his own Parisian panache to Franz Liszt’s Second Piano Concerto, a fascinating journey of melodic transformation. Click this link to experience a magical night like ours for yourself! As you all know by now, we love attending the San Diego Symphony! Their Summer nights Bayside concerts are the best kept secret here in SD. Last night, we attended the Tchaikovsky Spectacular, where seven compositions were played of various composers- mostly being Tchaikovsky. The conductor explained how Tchaikovsky's compositions were very "ballet-like" because he wrote some of our favorite classical music pieces like "Sleeping Beauty," "Swan Lake," and "The Nutcracker." Although the Summer Nights concerts by the bay are finished, there are always upcoming concerts at the Symphony Hall year-round. The 10 Best Things to do in San Diego! Being San Diego natives, we know some of the best things to do here in our city! We decided that since there are always tourists visiting the area, we wanted to give you all the DL about where to go while you're here! There is so much to do in the entire San Diego county, but we've listed, what we think, are the top things. Hope you enjoy! 1.) The Flower Fields at Carlsbad: 50 acres of blooming, colorful fields of different flowers! Take pictures and roam the fields of the picturesque flower ranch. Click this link and scroll to visit our blog post on our annual adventure here! 2.) Coronado Island: Explore an island off the SD coast where you can take a ferry or drive the famous blue bridge. There's the world-famous beach, The Del Coronado Hotel, and other fun things to do. 3.) 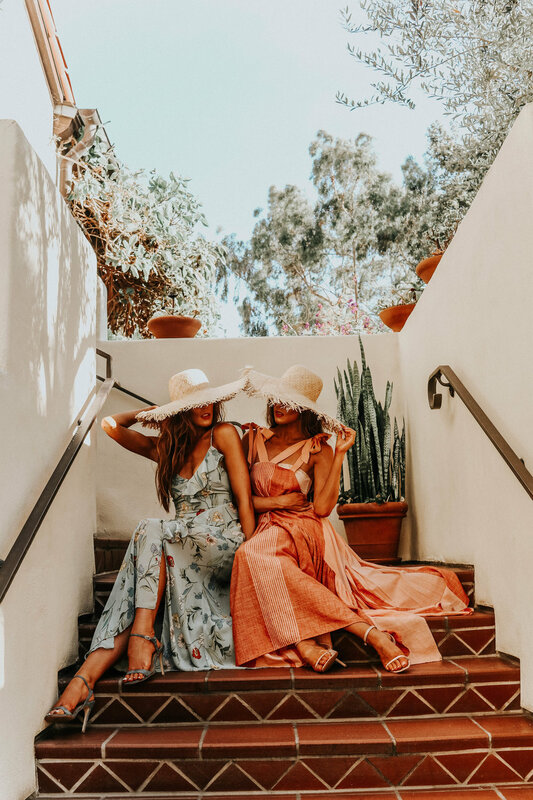 Opening Day at the Races: Attend the famous Del Mar Horse Races on opening day to be a part of the festive and fashionable events! Click this link and scroll down to see our blog post on our time at Opening Day! 4.) Hiking Potato Chip Rock: Among other amazing hikes, the potato chip rock hike is an eight-mile hike known for its overlook of Mt. Woodson Summit. 5.) SD Symphony: The amazing symphony concert hall as well as their outdoor Summer events and concerts are always a fun experience. Click this link and scroll to find our experiences at the San Diego Symphony! 6.) The San Diego County Fair: To locals, it is known as The Del Mar Fair, is a Summer event where all things fair-related come together! 7.) Balboa Park: The beautiful historic landmark consists of various museums, organizations, and missions to recognize the Spanish explorer, Vasco Balboa, as well as the San Diego region. 8.) Belmont Park: A place where one can: eat, shop, play, celebrate, and exercise. An amusement park located right on Mission Beach with a historic roller coaster and other fun attractions. 10.) Beach: Moonlight Beach, Cardiff Beach, Carlsbad Beach, La Jolla Beach, just to name a few! 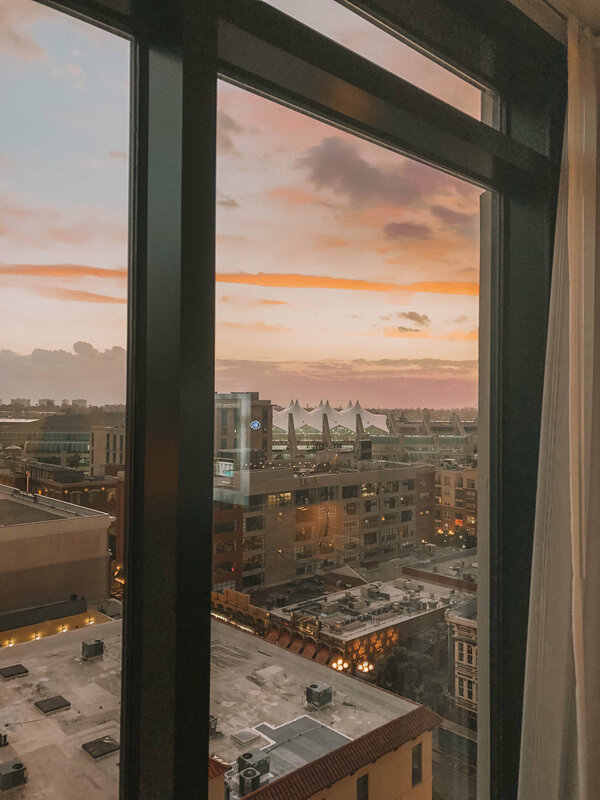 We hope our San Diego overview will help both locals and tourists alike about some of the best things to do here in San Diego! Getting the opportunity to attend the Bayside Summer Nights with the San Diego Symphony was so amazing. We were so excited to hear that La La Land would be playing because we love the Oscar nominated movie so much! The symphony played the soundtrack to this movie so beautifully, the whole night was an amazing experience for us. Having the San Diego bay to the left of us and the city to our right, the magical ambiance it created was something we will never forget. We got to sit picnic style on the lawn where we could view the symphony and movie simultaneously while snacking on food and beverages throughout the night. We recommend all San Diego locals or visitors to experience a summer night with the San Diego Symphony, because it is such a special experience! As for our outfits, we opted for a comfortable look wearing jeans and flowy Free People tops. To find brands, tap our Instagram photos to shop! We loved getting the privilege to celebrate one of our very best friend, Jessica's, bridal shower. We have been friends since birth, so it was amazing to be able to host this for her. Having all her friends and family from around the world able to come and help us celebrate was absolutely amazing! SD Cake Pop Shop so kindly collaborated with us and created these amazingly beautiful treats for this special day. Our theme was desert cactus, so they made us mini cacti with pink flowers. The talent that went into these cake pops was phenomenal! Our mom cooked and made gourmet appetizers for our meal, it was too delicious! From cheese platters to stuffed peppers and sautéed shrimp skewers, we could not have asked for anything more. The décor of sage and coral tones to create the desert-vibe. The gold and metal accents off-set the lace and ribbon streamers and delicate glass tableware. Party décor has always been something we love to do, and being able to create a beautiful event like this one was a lot of fun for us. Any time we get the chance to celebrate love and happiness, it makes us appreciate even more all of our friends and family. If you have the opportunity today, we hope we have inspired you to show your appreciation to your loved ones after you read this post! As one of our annual Spring traditions, we go to The Flower Fields at Carlsbad, and each year it seems to be even more beautiful than the last. Roaming around the Carlsbad Ranch is always fun because we absolutely love flowers! This place is covered with the most beautiful colors and variety of flowers of anywhere we have been. We met up with our fellow blogger friend, Nihan, so we could catch up and take photos for each other. The dresses that we wore, are as much again. We love the way these dresses blew beautifully with the wind and coordinated with the colors of the flower fields.